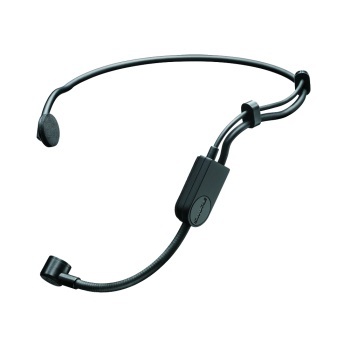 The PGA31 is an affordable wireless cardioid condenser headset microphone that delivers reliable sound quality for speech and live vocal performance applications. Designed for long-wearing comfort, the PGA31 offers a secure fit for hands-free operation in any situation. Its unidirectional cardioid polar pattern provides excellent off-axis rejection for higher gain-before-feedback when using a stage monitor. Available in bundled BLX, GLX-D, and PGX Digital wireless systems, the PGA31 features TA4F 4-pin connectors that make it a viable replacement for any Shure wireless headset system. Wireframe headset fits securely for active speakers and vocal performers. Permanently charged electret condenser cartridge delivers detailed, crisp vocals. Unidirectional cardioid polar pattern rejects unwanted noise for improved sound quality and higher gain-before-feedback. Flexible gooseneck design and discrete adjustment capabilities optimize microphone positioning for further source isolation. TA4F (TQG) connector seamlessly integrates with Shure wireless bodypacks. Included windscreen tames plosives for clean and intelligible sound reproduction. Tailored frequency response for great sound on vocals. Available with BLX, GLX-D, and PGX Digital wireless systems, renowned for ease-of-use and reliable performance. Legendary Shure precision engineering for durability and performance.